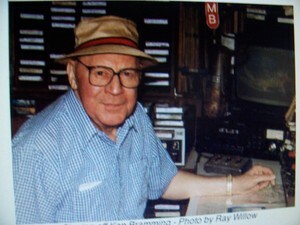 Most nights, driving home from work, I tune to WAMB to hear, not only the beautiful music, but the familiar voice of my old friend Ken Bramming. Then, after a short commercial break, you'll hear Ken's deep baritone again- "....We continue now with the fine sounds of beautiful music in the night on WAMB and WAMB-FM, Donelson". I listened to Ken last night.... and I'll probably listen tonight. The odd thing is, Ken died in 1997. Years ago, Ken assembled these tapes of mellow music, using his best late night voice. WAMB, whether through sheer genius, clever marketing, reluctance to change, or laziness, continues to play the old shows every night. And by doing that, they not only provide wonderful music for their audience, they're still fulfilling one of Ken's lifelong wishes.... to just quietly do his thing on the radio. Ken smoked too much. He was almost 71 when he died of lung cancer. His voice was a classic announcer's voice. A throw-back to the golden age of radio, before consultant-driven FM formats even existed. A simpler time. I first met Ken when he worked for WSM-FM back in the mid-70's. He was a funny guy who seemed to know everything about broadcasting and music, especially jazz, and the great singers like Tony Bennett, Frank Sinatra and Ella Fitzgerald. Ken was considerably older than me, but during hallway conversations at work, we discovered some common ground. We each had a lifelong fascination with broadcasting. And each of us had conducted a one-on-one interview with Louis Armstrong, a mutual favorite. Ken often said he never wanted to retire, that he'd just as soon die behind a microphone. Well, he didn't quite do that...... but seven years ago he did die. And yet, his wonderful voice is still there every night spinning out the beautiful music in the night. Check him out. Late night and the wee small hours of the morning on WAMB.